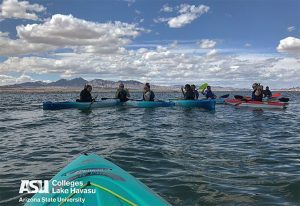 The collaboration between nature, recreation and education will soon have students skittering, paddling and pedaling Lake Havasu’s waves and shorelines after the final touches are wrapped up at the Arizona State University at Lake Havasu’s Beach Hut. The ASU Lake Havasu Beach Hut is at the northern mouth of Bridgewater Channel within the Lake Havasu State Park’s Windsor 4 area. The Beach Hut’s contents include non-powered water toys such as canoes, kayaks, paddleboards, and bicycles. A Hobie sailboat rests just outside it’s doors. All are at the disposal of ASU at Lake Havasu’s student body, Miers said. 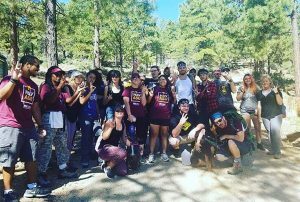 Rome described the campus’ student outdoor club, Outdoor Pursuits, as “travelling all over the state,” including destinations like Grand Canyon, Hualapai Mountains, Oak Creek Canyon and Sedona during their monthly excursions. On average, 20 students are linked to the group. ASU at Lake Havasu’s student body is about 150 students. “When there’s a full moon, they do moonlight kayaking,” she said of the outdoor club. 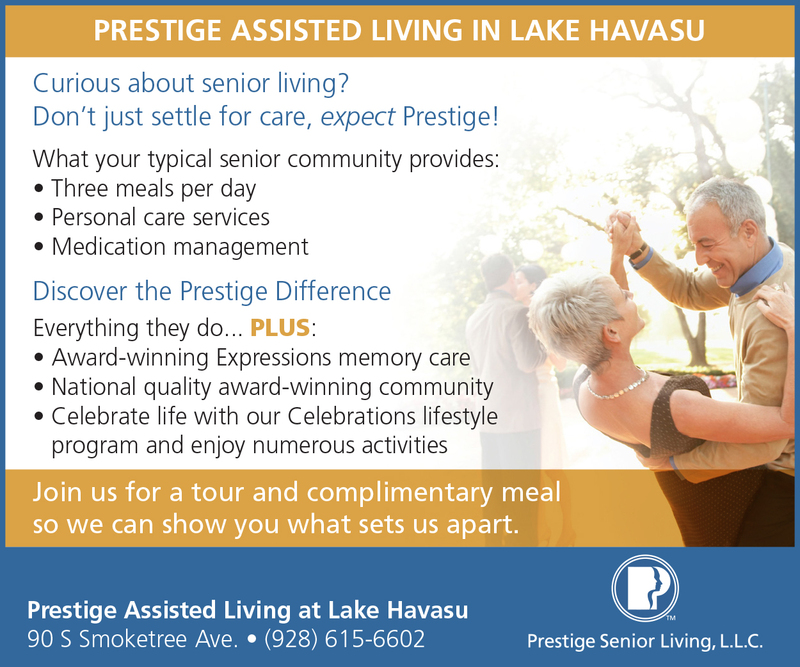 The ASU at Lake Havasu Beach Hut project launched in the autumn of 2017 as LHMA identified it as a need in the community. In short, the development of such an amenity would not only help draw students to the local ASU campus but help entertain and retain them. Miers, the LHMA group’s lead volunteer, said brainstorming in that capacity among the other volunteers visited ideas of raising money for tuition scholarships, creation of activities, and development of amenities. “It’s the smaller class sizes, the cheaper tuitions, the more personal relationships with professors because of the smaller class sizes, but what is there to do on the Lake for the students?” Miers said. The talks led to the ASU Lake Havasu Beach Hut. 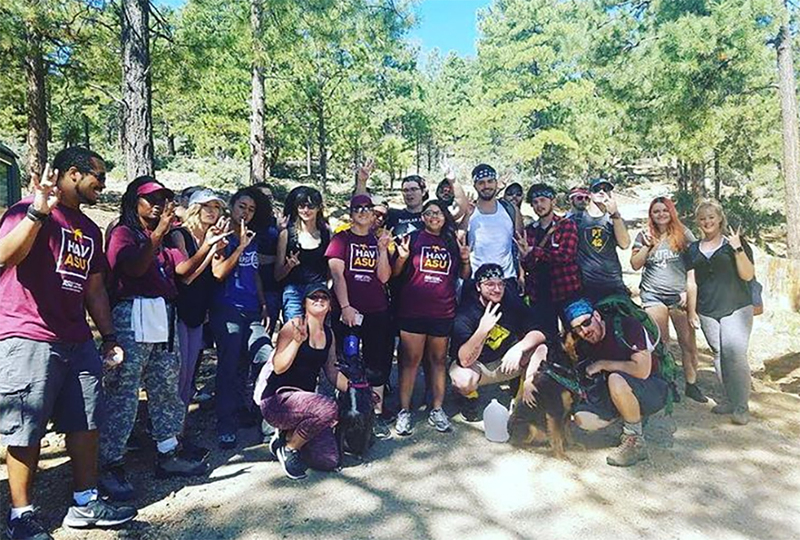 LHMA teamed with Home Depot, private donors from within the community, Arizona State Park officials, ASU at Lake Havasu, and Arizona Game and Fish Department to make it happen. The perk was opened to the students during Spring semester 2018 earlier this year. 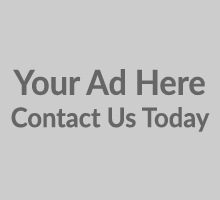 ASU Director Raymond Van Der Riet stated in an email that the use of the ASU Lake Havasu Beach Hut is for all students who pay the student fee and pass the AZGFD safety course. The fee is a $20 activities fee per student per semester. The AZGFD Paddlesports Education Course is a safety course offered statewide. 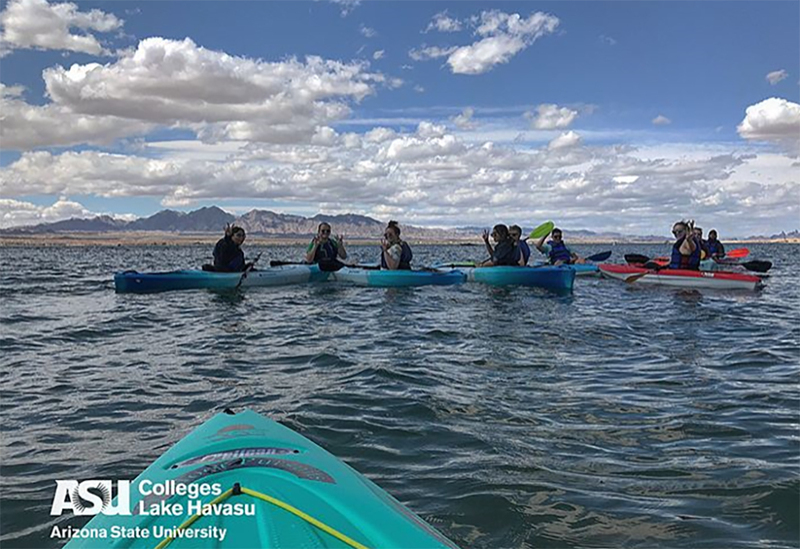 However, the instructors will be on hand exclusively for the ASU at Lake Havasu’s welcome week, which is set to commence the second week in August. 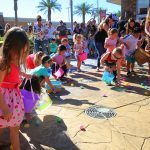 Students who partake in the classwork, pass a written test and on-the-water portion of the course, will be on track to use the water toys housed in the ASU Lake Havasu Beach House. 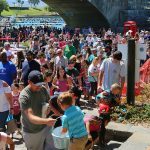 “We try to give paddlers everything they need to know to have a safe day on the water,” said Josh Hoffman, AZGFD Boating Safety Education Program Coordinator. The classwork covers terminology, preparedness, legalities of being on the water, and how to handle an emergency on the water. The 30-question multiple choice test determines if each student will earn the Arizona Paddlesports certificate. 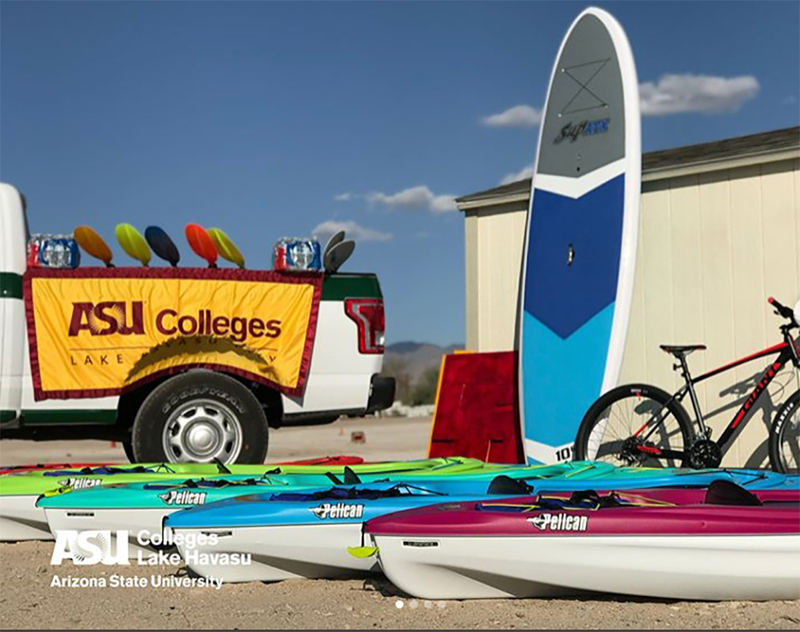 The Arizona Paddlesports Education Course is open to the public each month, too. The free course has proved its popularity in Havasu since March with classes being waitlisted, Hoffman said. The volunteer instructors come equipped with 12 kayaks and other necessary equipment. The courses are offered on the shores of Rotary Beach the second Saturday of each month. Pre-registration is required. Must be at least 10 years of age to participate. 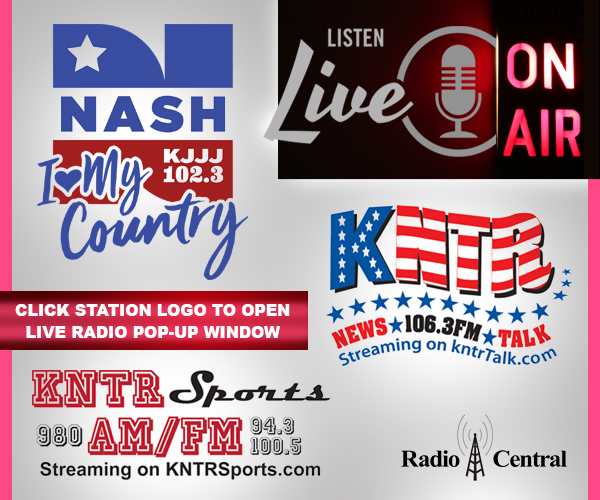 As of press time, there were eight seats open for the class set for Oct. 13. After the October class, the program goes dark again until March when water and air temperatures lend themselves more favorably to the sport, Hoffman said. For more information, or to pre-register for the Arizona Paddlesports Education Course, click here.